Brush cleaning is one of the most boring beauty tasks for me, but there really is nothing better than a set of fresh, clean brushes! I remember seeing the Sigma brush cleaning mat back in the day and really, really wanting it, but not only was it not available in the UK, I think it was around $20/$25, which I really couldn't justify for a plastic mat! So, when I saw the new Real Techniques releases, which included a brush cleaning mitt, I was on a mission to hunt it down! The mitt comes with 3 different textures for different shapes/sizes of brushes, and the bumps really help to deep clean the brushes. I just pump some soap onto the mitt, then go to town with really cleaning my brushes and giving them a good scrub. The textures definitely help to get all the makeup off the brush, and, if like me you have a lot of brushes, it prevents getting super dry hands from all the cleaning! 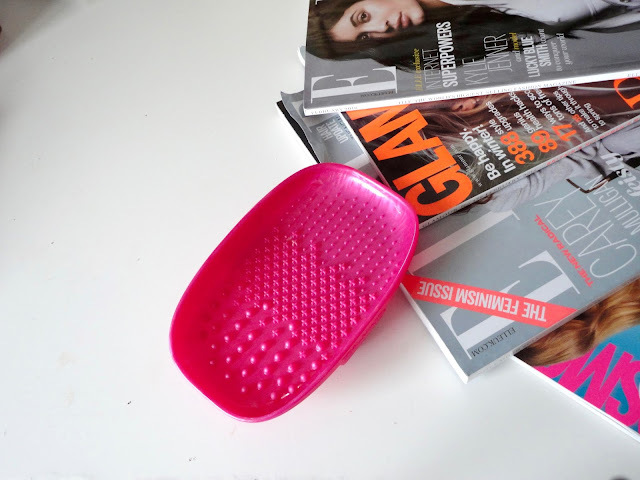 You can get the brush cleaning mitt from Boots, although I don't think it's online yet, so here is a link to buy from Look Fantastic - it's only £12.99 and will really benefit you if you have a ton of brushes or are a makeup artist, as it makes brush cleaning much easier! Have you tried this mitt, or the Sigma mat? Let me know in the comments!